0	0	The Message of Malachi	In Stock - Order before 4pm for same day dispatchWant it on Thursday 25 April? 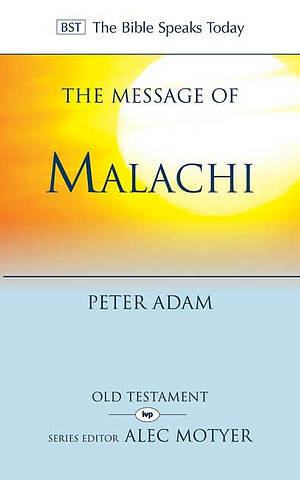 Peter Adam provides a readable and reliable BST exposition of the Message of Malachi for pastors, teachers and averagely interested readers. Standing between the end of the Old and the beginning of the New Testaments, Malachi summarizes all that’s gone before and also looks forward to the coming reign of God. God's persistence in speaking to an age that persistently contradicts or questions his every word is a clear and timely picture of the sin and grace in close proximity in our own times. God's people neither serve him enthusiastically nor turn away in blatant disobedience, but this is not neutral territory; it’s a minefield of self-deception. Through this BST commentary Malachi, speaks to the modern world about the need to bring performance into line with profession. His message, therefore, is current and Peter Adam shows how Malachi is God's effective remedy for such a situation and that, at the heart of God's people, must lie a deep, overwhelming conviction that God loves them. Here, Peter Adam makes an all-new contribution to the respected Bible Speaks Today commentary series with an accessible introduction and exposition of the book of Malachi in the BST legacy of readability, reliability and relevance. The Message of Malachi by Peter Adam was published by IVP in March 2013 and is our 15699th best seller. The ISBN for The Message of Malachi is 9781844746224. This is a helpful exposition of the last book in the Old Testament, the book of Malachi. In keeping with the approach of other volumes in the Bible Speaks Today series, it is not a detailed verse-by-verse commentary, but contains reflections on the main points of each chapter of Malachi. One of Peter Adam's priorities is to show how Malachi, (which he understands to be the prophet's own personal name, and dates to somewhere between 460 and 400 B.C., close to the time of the ministry of Ezra and Nehemiah) is addressed to the whole community of Israel, and not just to individuals. He does this well, demonstrating how relevant Malachi is to the contemporary church. Got a question? No problem! Just click here to ask us about The Message of Malachi. The book of Malachi sits aptly in Christian Bibles as the last book of the Old Testament, which it assumes, summarizes and applies, as it also looks forward to the New Testament, with its promises of the coming reign of God. A striking feature of the book is the way in which every word of God is contradicted or questioned by his people. God's persistence in speaking to them is a clear picture of sin and grace in close proximity. Furthermore, God's people neither served him enthusiastically nor turned away in blatant disobedience. This was not neutral territory, but a dangerous whirlpool of self-deception. Peter Adam's valuable exposition shows how Malachi is God's effective remedy for such a situation. The greatest sin of God's people is the sin against God ? the source of all sin against ourselves and others; and at the heart of God's people, the church, must lie a deep, overwhelming conviction that God loves them.